All Conferences - A directory focusing on conferences, conventions, trade shows, exhibits, workshops, events and business meetings. American Historical Society Annual Meeting - The AHA was founded in 1884 and has held an Annual Meeting since 1885. Meetings are held Thursday-Sunday, the first weekend in January following New Year's Day. American Library Association (ALA) Events and Conferences - The ALA, made up of eleven divisions and fifteen offices, sponsors numerous conferences, meetings, forums, institutes, library promotions and other events. American Society of Civil Engineers (ASCE) Conferences - Research and technical developments in civil engineering. APA Conferences, Seminars & Calls for Papers: Index - A directory maintained by the American Philosophical Association. Association for Computing Machinery (ACM) Conferences - ACM provides an objective arena for the discussion of cutting-edge and often competing ideas. Association for the Advancement of Artificial Intelligence (AAAI) - Information about current, past, and forthcoming conferences. Association of Writers and Writing Programs Annual Conference - Each year, AWP holds its Annual Conference in a different region of North America in order to celebrate the outstanding authors, teachers, writing programs, literary centers, and small press publishers of that region. Annual Conference typically features 300 presentations: readings, lectures, panel discussions, and forums plus hundreds of book signings, receptions, dances, and informal gatherings. The conference attracts more than 5,000 attendees and more than 400 publishers. It's one of the biggest literary gatherings in North America. Bioneers Conference - A leading-edge knowledge forum where social and scientific innovators illuminate breakthrough solutions for restoring people and planet. Bloomberg LINK - Produces invitation-only, in-person gatherings that combine world-class editorial programming with peer-to-peer networking amongst the who's who in influential communities. Brings the power of Bloomberg to the executive conference business, leveraging the resources of a global organization with more than 2,000 journalists in 140 bureaus around the world, multiple media platforms and the world's most valuable online community, comprised of hundreds of thousands of financial professionals. Conference Directory - International conference, seminar, and workshop directory. Dow Jones Conferences and Webinars - Hosts a number of events for the international business community. EDUCAUSE Conferences, Seminars and institute Programs - Balancing the demands of IT and education. Euromoney Conferences - Business, financial and investment discussion. 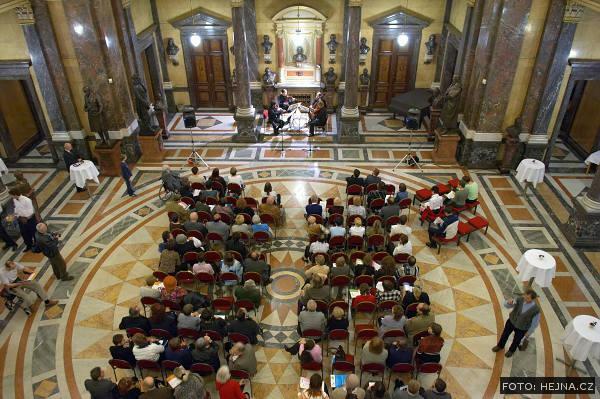 European Research Conferences - A programme of the European Science Foundation. Each conference consists of a series of five-day long scientific meetings on one and the same general topic, spread over several years (typically one meeting every other year). These are discussion meetings at which scientists discuss new developments in their particular scientific discipline. GoToMeeting - Cost-effective way to organize and attend online meetings. Gordon Research Conferences - An international forum for the presentation and discussion of frontier research in the biological, chemical, and physical sciences, and their related technologies. GoToMeeting - Secure and cost-effective solution for conducting online meetings. IEEE Computer Society: Technical Conference - Links to hundreds of conferences in computer science and engineering. IHS Events/Conferences/Webcasts - Defence, security, police aerospace and transport. Informa plc - The largest publicly-owned organiser of exhibitions, events and training in the world. Internet Society Conferences - Through its annual International Networking (INET) conference and other sponsored events, developing-country training workshops, tutorials, statistical and market research, publications, public policy and trade activities, regional and local chapters, standardization activities, committees and an international secretariat, the Internet Society serves the needs of the growing global Internet community. Lecture List - A searchable list of public talks taking place in the UK. LexThink - Helps facilitate conferences. Live Meeting - Web conferencing service. Modern Language Association Annual Convention - Over 9,000 scholars from around the world present their research, visit book exhibit, and mingle with colleagues. Nature: Conference - Science research conference updates. NIST Conference Program - scientific and technical conferences. NIST is an agency of the U.S. Commerce Department's Technology Administration. O'Reilly Conferences - From Web 2.0 to data science, open software to GIS aware, web performance to publishing innovation, O'Reilly technology conferences create a space for alpha geeks, thought leaders, and decision makers to collaborate face to face. Platts Conferences and Events - Energy business and industry. Pugwash Conferences on Science and World Affairs - The purpose of the Pugwash Conferences is to bring together, from around the world, influential scholars and public figures concerned with reducing the danger of armed conflict and seeking cooperative solutions for global problems. SIAM Conferences - SIAM conducts several specialized conferences, short courses, and workshops, as well as the SIAM Annual Meeting. SIAM conferences focus on timely topics in applied and computational mathematics and provide a place for members and the entire applied mathematics and computation community to exchange ideas and to meet with and expand their network of colleagues. SMi Conferences - The aim of The SMi Group is linking business with information through the delivery of high quality business information services. The SMi Group is a leader in business to business information with products spanning over 250 countries. Technical Conference Information Center - Calendar of hi-tech events in engineering and medical/life sciences. Technology and Culture Forum at MIT - Prrograms explore the role of science and technology in promoting positive social, ecological, and economic change. In addition, they stimulate discussion about the ethical implications of scientific discovery and technological innovation. TED Conferences - Technology, entertainment, design. Electricity for the Brain... Tools for the Mind... Food for the Soul. UN Conferences, Meetings and Events - Upcoming conferences and General Assembly Special Sessions. Voice of the Shuttle (VoS) - Literary studies conferences. VRST: Virtual Reality Software and Technology - Serves as the main contact point for all ACM VRST conferences. WebEx - Web conferencing, video conferencing and online meeting services. This webpage last updated on Wednesday, May 3, 2017 12:42 PM.